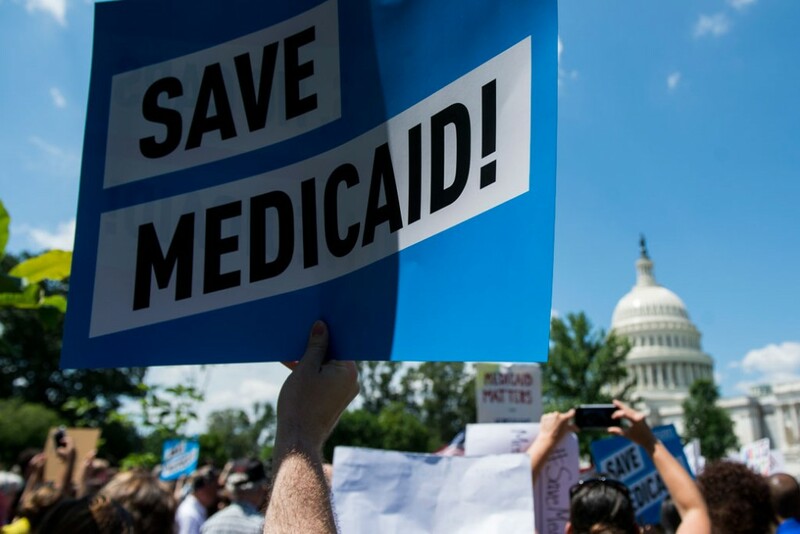 This week, the Trump administration issued policy guidance that effectively ends Medicaid as we know it, allowing states to place punitive work requirements on certain Medicaid recipients—more than 7 in 10 of whom are caregivers or in school. Although these so-called work requirement policies may seem reasonable at first glance, in practice, they’re a way to strip away health insurance from struggling unemployed and underemployed workers. President Donald Trump’s actions are just the latest shoe to drop in his party’s deeply unpopular crusade to undermine Americans’ health care—including the highly popular Medicaid program—and come on the heels of a tax cut that rewards the massively wealthy over working Americans. New CAP analysis shows that at least 6.3 million Americans—including students, caregivers, and retirees—could be at risk of losing their health care. * This includes nearly 640,000 people in the 10 states that have already filed for waivers to implement Trump’s plan. In a piece of good news, Gov. Charlie Baker (R) of Massachusetts immediately committed to not participating in Trump’s efforts to take health care away from his state’s residents, and additional governors may join him in the days ahead. However, following the release of the new policy, additional states are also likely to join the ranks of the 10 states with pending waiver requests, with policymakers in Louisiana already making their intentions to do so known today. Analysis by the Kaiser Family Foundation reveals that the majority—60 percent—of working-age adults who receive Medicaid are already working. ** Of those who do not already have a job, more than one-third are ill or disabled. While many in this group are still at risk under Trump’s plan because they may not qualify for Medicaid on the basis of disability, CAP’s analysis excludes these individuals to ensure a conservative estimate. Of the remaining nonworking adults, more than 7 in 10 are either providing needed care to loved ones (2.9 million) or are attending school (1.5 million). Research shows that so-called work requirements are not just cruel—they are actively counterproductive. Taking away health care from these jobless workers won’t help them find work any faster. In fact, it may actually reduce their ability to find a job. What’s more, Trump’s guidance is not only punitive across the board, it disproportionately impacts women, African Americans, and Native Americans. Trump claimed he’d be a champion of working people, but his so-called work requirements are not about work at all—they don’t create a single job for unemployed and underemployed workers. Rather, his policies are simply a backdoor way to dismantle Medicaid and take health insurance away from struggling Americans. Katherine Gallagher Robbins is the director of family policy for the Poverty to Prosperity Program at the Center. Rachel West is an associate director for the Poverty to Prosperity Program at the Center for American Progress. 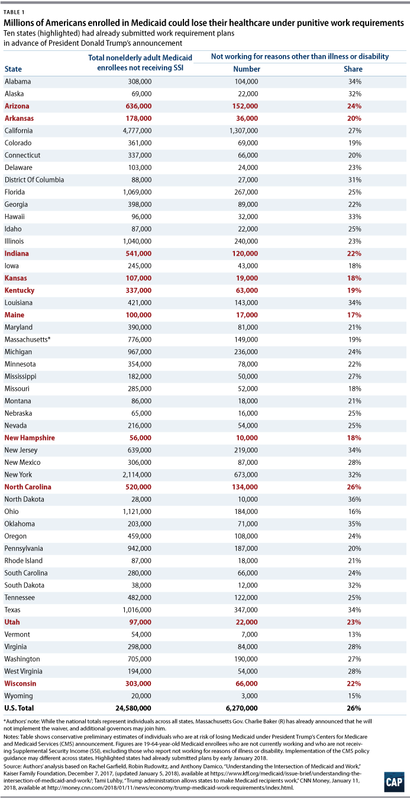 *Authors’ note: While this represents CAP’s conservative estimate of the total number of adults at risk, the exact number subject to work requirements in the states that choose to implement them will depend on the individual parameters of the state’s plan. **Authors’ note: Specifically, the Kaiser Family Foundation’s analysis of 2016 Current Population Survey data covers nonworking 19–64-year-olds who received Medicaid at any time during 2016 but were not receiving Supplemental Security Income (SSI). As Kaiser notes, counts based on survey data may be lower than those based on administrative data due to underreporting.